Horses of Hope (formerly the Adaptive Riding Institute ) welcomes all those who seek our services. Operating continuously since 1988, our programs use the natural movement and empathy of the therapy horses to improve the health and welfare of our participants. Our Vision: To continue the expansion of our equine-based programs, and the development of this facility as a community resource for personal wellness and development for the greater Willamette Valley community and Oregon. Our Mission: To improve the lives of people living with physical, emotional, and behavioral challenges through innovative, accessible, safe and rewarding equine assisted programs of the highest quality. 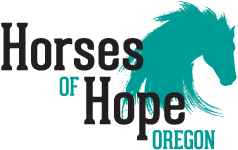 SUPPORT HORSES OF HOPE OREGON!